This beauty transforms one of the staples of traditional Asian, South American, and African garments into a fresh contemporary style you can wear every day! It's elegant AND casual and fabulously unique in any color. And this one is STUNNING in black and white sousde! 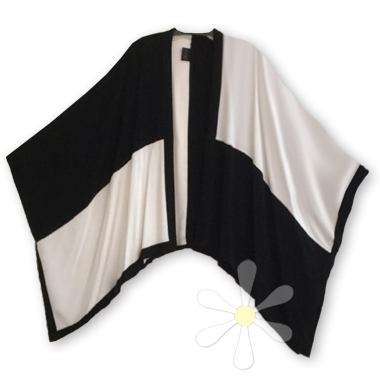 The sides are open, tacked in one spot to form its most outstanding feature, long kimono-like sleeves. A decidedly global look without diminishing its ethnic past. Indoors or out, its a yummy layer to wrap yourself up in!